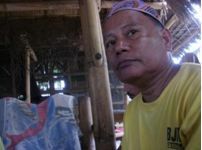 In this thirteenth interview, Alex Salipada, an Imam working as labourer at the General Santos City Fish Port, talks about how the policemen tortured him by water boarding while in the police custody. Alex was illegally arrested, detained and deliberately hidden from his family for nine days. When Alex was arrested, the policemen attached to the General Santos City Police Office (GSCPO) neither showed to him an arrest order nor explained the reason for his arrest. He was at home looking after his children at the time of his arrest. He is known in his community as a religious person. Alex was tortured and falsely charged together with Hamsa Pedro. For details about Alex’s case, please see: AHRC-UAC-178-2012. In a separate interview, Alex’s wife, Hadji Noria, earlier talks about how the policemen deliberately hid her husband from her when they were looking for him. I am Alex Salipada. I was abducted by police elements last June 20, 2005 at 5pm in my house. While seating on a chair in my house, I saw a white pick-up truck passing by the house of my neighbour. I wonder what it was. At that time, my children were still young. They were playing in our house. (While my children were playing) I wondered they (policemen) were already in front of me in my house. I looked back and saw them pointing their guns at me. They were carrying handguns, like calibre .45 and .9mm. I ask them: “Sir, what is my fault?” He told me: “You explain yourself at the police precinct.” They immediately took me. They were heavy-built men unlike me, small. They threw me inside the car. While seating in the car, they pressed my stomach. They tied my hands, feet, face and my eyes with packing tape. I couldn’t speak because they were hitting my head. I couldn’t tell where they took me. I could not see because they blindfolded me with a packaging tape. It was very painful. I could hardly remove it. My eyes were hurt. When we arrive at the place (Family Country Hotel), I was asked to seat. I have no idea about the place where they took me and where I was seating in. I only know later that it was Family Country Hotel. They took me to a hotel. They tied my hands with packaging tape while I was sitting. They accused me that I was one of those who bombed the public market in 2004. I told them: “Sir, I don’t know about that. It was not me” They brought me to the toilet. They dragged me there. I told them that, “How could I admit it? I didn’t do it. I do not know the persons who did it.” They pushed me down. They wet a towel and put it on my face. Then, they inserted a hose into my nostrils and doused water in it. I felt like my breathing suddenly stopped. Then, they quickly put me in a sitting position and pressed my stomach. I could feel all the water going in my stomach. I felt like my breathing stopped again. I thought I was already dead. That is what happened to me. Many of them (policemen) came in just to kick me. They punched me. When I urinated, my urine is blood. I spat blood at that time (at the Family Country Hotel). It was in June 20, 2005 at the Family Country Hotel. Q: What questions did they ask you? A: They asked many questions. I was asked: “Who bomb the public market, was it you?” I said: “No, I do not know who did it. I don’t know who they are.” They were also looking for fugitive (from me). Here, they severely hurt me again because I could not tell. How could I tell them I know those persons when I do not know them? But they told me: “You know this person. They are your companions.” What can I tell? I could not tell them that. But when I tell them “No, I do not know them, they would again kick me. Q: How many days was it before Hadji Noria, found you? Q: Where did you see each other? A: We meet at the barracks (General Santos City Police Office). It was night time (around 10pm). Q: Did they take you to the doctor for examination? A: For my part, they did take me to the doctor for medical (examination). But it was nothing. We did not even get the result. When I arrived here, (showing his ribcage) this one is swelling due to severe beatings. My wife hugged me. They (policemen) repeatedly kicked me (while under torture). During my arrested, the police official in charged was Maximo Sebastian. It was him who tortured us. Q: What are the charges filed against you? A: For my part, they filed charges of multiple murder at multiple frustrated murder. But to be honest, I did not do it (bombing at the public market). They are using me only as a replacement to the real accused (for their) accomplishment. The views shared in this interview do not necessarily reflect those of the AHRC, and the AHRC takes no responsibility for them.